Why take a drive to view the fall foliage when you can soar above it? Or would you prefer viewing the autumn colors by trotting down winding paths on horseback? Bed and breakfasts are offering unique ways of enjoying the time of year when the deep greens of summer are replaced by brilliant reds, golds, oranges and yellows in a stunning canopy of color. This trip will be one for the photo books. The View From Above. The Mayhurst Inn (www.BnBFinder.com/MayhurstInn) in Orange, VA, will arrange a fly over the Blue Ridge Mountains and Shenandoan Valley in a Biplane. Package includes two nights accommodations, a full breakfast each morning, and champagne and strawberries in the room along with a post-dinner dessert. Up, Up and Away! The HideAway Country Inn (www.BnBFinder.com/HideAwayCountry) in Bucyrus, Ohio, also offers guests a view of the foliage from above but this time during a hot air balloon ride over the heart of Ohio’s farm country. A complimentary bottle of champagne is included in this package. By Lake or By Land. 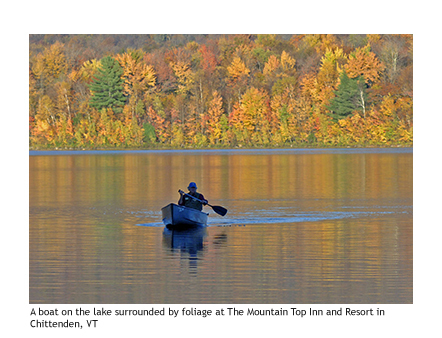 At The Mountain Top Inn and Resort (www.BnBFinder.com/MountainTop) in Chittenden, VT, guests can enjoy a kayak, boat or canoe excursion while taking in the lakeside foliage or guided horseback rides through the colorful paths of the Green Mountain National Forest. Get On Your Feet. The Rosewood Country Inn (www.BnBFinder.com/Rosewood) in Bradford, NH, has created an ‘Inn to Inn Hiking Adventure’, a 3 mile hike that begins at Rosewood and finishes at the Candlelight Inn. Guests will view the foliage up close and observe wildlife in the area including wild turkeys, deer and moose. Package includes two nights lodging, a guided hike with lunch, and breakfast and dinners each day. Make sure to contact the inns for availability, black out dates and restrictions. For a full list of fall getaways visit http://www.BnBFinder.com/Fall. BnBFinder.com is a top-rated directory with thousands of B&B, inn, and boutique hotel listings from all over the world.